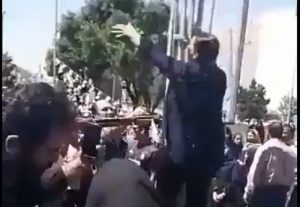 In the city of Karaj, Iran a brave woman dared to openly defy the clerical regime. 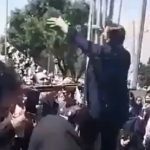 In the morning of June 13th, the woman appeared in Mehran Square and loudly chanted anti-regime slogans, including “Death to Khamenei”- regime’s Supreme Leader. She shouted angrily about the regime’s arbitrary execution of political prisoners, individually mentioning the case of Hossein Panahi. She went on to condemn the open killing of the country’s youth, robbing them of their futures in an attempt to monopolize power. As she spoke, a small crowd gathered. People filming on smartphones quickly put the woman’s tirade on the internet, where she has received support from the Iranian public. The woman’s public demonstration of anger comes as brave females across Iran have demonstrated a larger role in the opposition movement. Women have turned out in large numbers at recent protests. Women in Iran face discrimination and difficult living and working conditions. The People’s Mujahedin Organisation of Iran (MEK) reported on the appalling working conditions many Iranian women face on a daily basis. The report highlighted the payment of lower wages for women and unsafe working conditions, no insurance, no employment benefits, and little or no job security. There is also systematic discrimination against women in the employment process. The regime holds highly misogynistic views on the role of women in society. It makes no attempt to level the employment playing field by removing structural barriers the discriminate against women in the workplace. According to the MEK, the recent economic turmoil that has gripped the country has also disproportionately affected working women. In times of economic hardship, women are the first to lose their jobs. Married women, in particular, face the chop first. Employers do not want to risk their workers taking time off in the future for maternity leave. These discriminatory practices have mobilised women on an even grander scale. Women, like the brave woman in Mehran Square, are joining the opposition movement in larger numbers and taking to the streets more frequently than before. The women of Iran will have a decisive role to play in showing the regime that the maintenance of the status quo is unacceptable to the Iranian people.